On Thursday, August 28, 2014, beloved mother, acclaimed author, and treasured friend Penelope "Penny" Niven of Winston-Salem, North Carolina, passed away at Wake Forest Baptist Medical Center surrounded by her family, whom she deeply loved and cherished. Penelope Niven was the critically acclaimed author of Carl Sandburg: A Biography, Steichen: A Biography, and, most recently, Thornton Wilder: A Life. She and actor James Earl Jones co-authored Voices and Silences, praised as a classic on acting, and she also penned a memoir, Swimming Lessons. Carl Sandburg: Adventures of a Poet, her biography for children, was awarded an International Reading Association Prize "for exceptionally distinguished literature for children," one of six books honored among publications from 99 countries. Niven was awarded two honorary doctorates—one from her alma mater Wake Forest University—three fellowships from the National Endowment for the Humanities, and the Thornton Wilder Visiting Fellowship at the Beinecke Rare Book and Manuscript Library at Yale University, among other honors. She received the North Carolina Award in Literature, the highest honor the state bestows on an author. During the past twenty-five years, she lectured across the United States and in Switzerland, Canada and Wales; served as an editor for various publications; and was a consultant for television films on Sandburg, Jones, and Steichen. 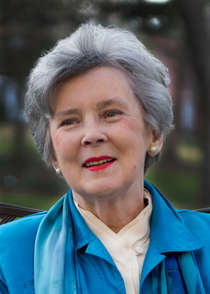 She also spent twelve years as Writer-in-Residence at Salem College in Winston-Salem, where an international writing prize was named in her honor, along with the creative writing portfolio prize given each year to a Salem student. Niven's daughter, Jennifer, is an award-winning author as well, and the two loved doing mother-daughter writing programs and workshops together, which they conducted around the world. At the time of Niven's death, she was working on several projects. She and Blanton Belk were completing his autobiography in celebration of the 50th anniversary of Up with People. Niven was also continuing her work on Thornton Wilder—preparing a book titled Wilder on Writing, and editing a Wilder Reader. In October she was to be the keynote speaker at the Burbank Public Library's NEA-funded Big Read celebration of Our Town. Earlier this summer she returned from Barbados, where she was working on a project with world-renowned artist and friend Lonnie Eugene Stewart. As impressive as her career was, Penelope Niven's legacy reaches far beyond her work. She always said her greatest work of art was her daughter, and their profoundly close mother-daughter relationship was inspiring. Niven was loved by all who knew her—no matter how briefly. Her family recognizes that her passing is a loss not only felt by them, but by the entire community as well. Her words and the joy with which she embraced each day fundamentally enriched lives around the world. As she once wrote, "I want my epitaph to testify that I have been a loving mother, wife, daughter, sister, aunt, and friend; and I have taught, written, and lived with joy." A memorial service will be held in Niven's hometown of Waxhaw, North Carolina, at the Waxhaw Methodist Church this Saturday, September 6, at 1:00 pm. There will be an additional service in Winston-Salem, which was home to Niven for over twenty years. That service—to celebrate Penny's life, her contributions, and the many lives she impacted—will be held Monday, September 8, at 11:00 am at Wake Forest University's Brendle Recital Hall, Scales Fine Arts Center. In lieu of flowers, donations may be made to the American Cancer Society ( http://www.cancer.org/) or the CP3 Foundation (the Chris Paul Foundation: http://www.cp3foundation.org/).